The 2008 Summer Olympics will be celebrated from August 8, 2008 to August 24, 2008, with the opening ceremony commencing on 08 August at 8 pm at the Beijing National Stadium in Beijing. The 2008 Olympics will see the return of 28 sports, and will hold 302 events. 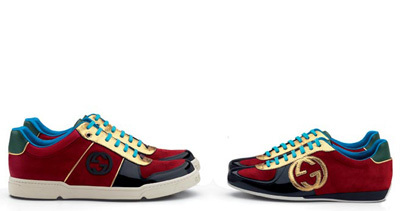 Inspired by this huge event Gucci is pleased to present their “8 – 8 – 2008 limited edition”. Creative Director Frida Giannini epitomizes sporty luxury in the 8 exclusive accessories taking her cue from the competitive sports. The noteworthy item in this creative collection is the new I Gucci watch. Gucci’s first ever digital timepiece is the most tantalizing thing for cosmopolitan watch fans and will be sold everywhere in the world unlike the rest of the collection which will be sold exclusively only in Hong Kong and mainland China. Its flawless digital face features both numerical or clock hand format, black dial and steel frame to epitomize sporty elegance. 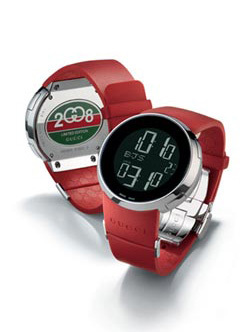 The surface of its red monochrome rubber strap is engraved with the Gucci logo on the exterior, while the interior has been embossed with Gucci’s iconic GG pattern. To pay homeage to China Frida created a panda. Though created for leisure the panda-teddy-bear is of the impeccable quality and done in soft leather. And the necklace inspired by military tags, in sterling silver and enamel making it the perfect accessory for casual looks. 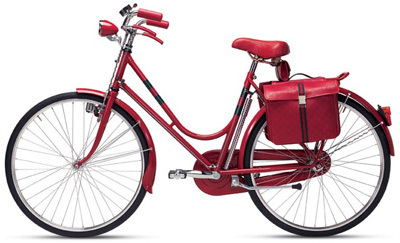 Frida also proposes the bold “La Pelle Guccissima” for two pieces of luggage. 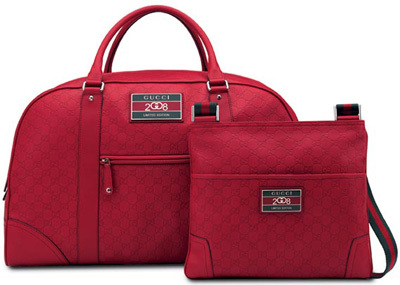 The first is chic, sturdy leather duffel and the other is a soft leather messenger bag with Gucci’s iconic green-red-green web on the shoulder strap. Also collection includes sports shoes, for both men and women, articulated in a fresh patchwork of suede, patent leather and gold trim.